Ska covers band Skandals are making groovy waves on the pub-gigs scene in the Scarborough area. Drummer John Allsopp describes ska as "working-class dance music for everyone". 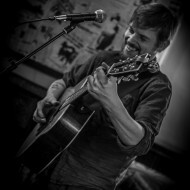 Sam McKie interviews Nick Rooke, East Yorkshire singer-songwriter, well known on the local festival circuit. I caught up with Nick Rooke at Beverley Folk Festival, just after his Sunday session. Have you enjoyed playing here, It looks like a good crowd? On the Saturday Night of this year's Scarborough Jazz Festival, one of the best guitarists in the world, John Etheridge, teams up with Violin Virtuoso Nigel Kennedy. Louis Barabbas, frontman with The Bedlam Six, talks to Yorkshire Coast Gigs ahead of their appearance at Galtres Parklands Festival this summer.